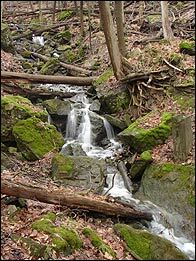 Lower Sanatorium Cascade, also known as Lower Sanatorium Falls, is considered a Talus Cascade. Its height is 4 metres (13 feet) and its width is 1.8 metres (6 feet). It experiences its strongest flow during seasonal storms and after the winter snow melt. 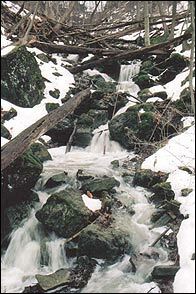 Lower Sanatorium Cascade is located on a tributary of the Chedoke Creek. Lower Sanatorium Cascade can be reached by parking in the Chedoke Golf Course parking lot, following the pathway (Chedoke Radial Trail) westward for about 10 minutes until you reach the first ravine on the left side. Follow that ravine up about 50 m to Lower Chedoke Cascade.